Can You Change the Terms of a Contract? This question could go either way depending on if you’re the seller or the buyer. However, the contract really determines what your options are at this point. Home buyers or sellers may change their minds for a variety of reasons, but it’s important to remember there are consequences. This is a legal agreement that causes both parties to put certain actions in motion. Depending on how far they have proceeded with these activities, you may find that you’re paying for their losses. If you’re the potential buyer of a home and want to back out, you really have look at the fine print of your contract. Certainly, legal courts will recognize unintended and unanticipated emergencies, but that doesn’t prevent additional fees from being added on. The seller of the home may have already contracted for a new residence. If they are going to be charged double because you backed out of the deal, you might have to pay them the difference. For those cases that are particularly complicated, it might be wise to consult with a real estate attorney and see what your options are. Homes for sale can attract a lot of potential buyers, but what if yours tries to back out? While it might seem they are ethically and morally responsible for financial damages, you will have to show documentation of this as well. When court action is required, you’ll need these documents in order to win a judgment. This is another reason why it’s so important to really talk with the house buyer before any papers are signed. While you can’t prevent everything, it will help both parties profit from this transaction. We Want to Sell…. Er, No, We Don’t! When you own a home and decide to sell, it’s always your choice who you sell it to. 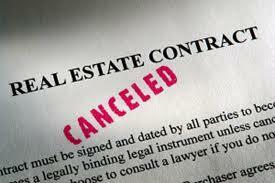 However, when contracts are involved, now those buyers have legal recourse if you actually cost them money. If you do come across a situation where it’s absolutely necessary to change your mind, try to make it easier for the buyer. Did they have costs you can reimburse? Are you able to give them back their earnest money deposit? Can you pay them back for a credit report they purchased? If you don’t approach this correctly, you could end up having a very upset home buyer on your hand. This might cause them to seek out legal retribution from you. Not every situation can be saved, but you need to pay attention to the legal details. Make sure you stay out of trouble with the legal end of it, and you might be able to save both parties a big financial hassle. If you follow this technique with all your real estate purchases, they will be more profitable and less stressful overall. This is filed under Buying & Selling.